Promo: Rain Man. Mon 12th – Sat 17th November. Derby Theatre. – East Midlands Theatre. Promo: Rain Man. Mon 12th – Sat 17th November. Derby Theatre. Based on the MGM motion picture. Story by Barry Morrow. Screenplay by Ronald Bass and Barry Morrow. 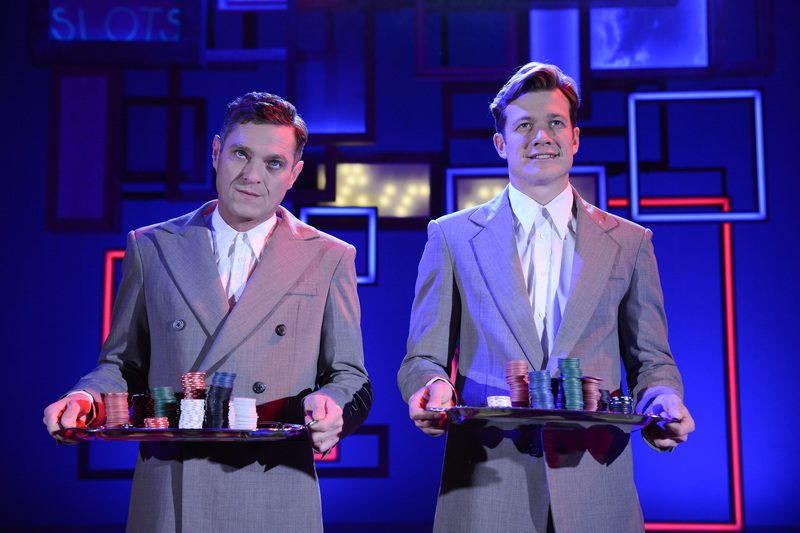 Produced by special arrangement with Metro-Goldwyn-Mayer Studios Inc.
From Monday 12 until Saturday 17 November, Derby Theatre is proud to play host to the national tour of Rain Man, starring Mathew Horne and Ed Speleers and presented by Bill Kenwright’s Classic Screen to Stage Theatre Company. Mathew Horne (Gavin and Stacey, The Catherine Tate Show) stars as Raymond and Ed Speleers (Downton Abbey) stars as his brother, Charlie. Joining them is Mairi Barclay (Pippin), Hannah Barker, Elizabeth Carter (Dreamboats and Petticoats), Adam Lilley (The 39 Steps), Neil Roberts (Mamma Mia!) and Joe Sellman Leava (Monster). Inspired by the heart-warming Oscar-winning film, which famously starred Tom Cruise and Dustin Hoffman and won Oscars for Best Picture, Best Screenplay, Best Director and Best Actor, Rain Man follows previous acclaimed Bill Kenwright productions of films to the stage such as A Few Good Men, The Shawshank Redemption and Twelve Angry Men. When self-centred salesman Charlie Babbitt discovers that his long-lost brother Raymond, an autistic savant with a genius for numbers, has inherited the family fortune; he sets out to get ‘his half’. Rain Man has been directed by Jonathan O’Boyle (who hails from Derby) and whose credits include Rasheeda Speaking (Trafalgar Studios); This House (UK Tour); Pippin (Hope Mill Theatre/Southwark Playhouse) and Hair (Hope Mill Theatre/The Vaults), winner of the WhatsOnStage Award for Best Off West End Production. Book tickets for Rain Man (tickets from £15, with £2 off for under 19s – excluding band E). Promo: Curve Announces Christmas 2019 Production Of West Side Story.